I am off to Baja, Mexico for a great whale photo shoot this weekend. Every year around this time, Humpback and Gray whales come down from the frigid waters in Alaska to the warmer seas around the west coast of Mexico. The Gray whales give birth to calves and nurse them there for a few months until they are ready to make the return journey back to Alaska in the summer. The America Cetacean Society reports seeing Gray whales and calves passing by southern California on their way down to Mexico. Usually the calves are born in the lagoons in Baja but it seems some whales have already given birth along the way. This is good news because it will give the calves more time to nurse and get stronger for their grueling return journey. The action is generally good and I have taken some great photos in this area but wildlife encounters is always unpredictable. I will try and keep in touch and post some shots when possible. 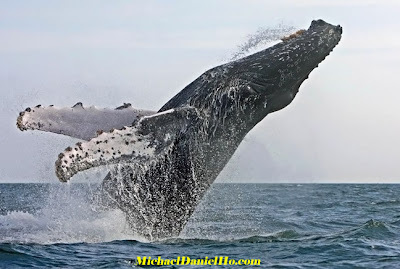 In the meantime, you can visit my website MichaelDanielHo.com to see plenty of whale shots from my previous trips.